At the right is my Sony Clie in the process of getting it's digitizer replaced. That's the old digitizer in the upper part of the picture, the front case at the left, the rear case at the upper right and the working bits in the middle. You might remember, that my Clie TJ27 got run over after my belt clip broke and it landed in the snow back in January. Or you might have a life and not be concerned about my trivial personal problems. Anyway, it was a little crushed, the digitizer was shattered but it still powered up just fine. I found I could order a new digitizer for about $40 from pdaparts.com. So I bought one and one for my old Clie S320 that also had acroken screen. The newer one was a bit harder. First of all, half of the screws were these funky triwing security screws. I guess Sony thought there was something dangerous inside. Probably didn't want folks trying to change their batteries. A coworker had bought a new case for his son's Gameboy and it came with a little triwing screwdriver that he let me borrow. Once I got the case apart, the real fun began. In the old one, the LCD and digitizer were held in with one screw, in the new one it's glued down. In the old one the connectors were completely exposed once you removed that screw, in the new one the connectors were sandwiched between the metal frame and a PC board and because of the way all the connectors are laid out, you can't completely expose them. In the old one there was only the metal frame holding the LCD/digitizer assembly, in the new one the LCD/digitizer frame is tucked down inside another metal frame. The old one was merely cracked, the new one was shattered in dozens of little shards that were hard to get cleaned out. Anyway, I know this is all very exciting. The bottom line is that it was more challenging that I anticipated, but I managed to get it all put back together. Unfortunately, since it's been almost 3 months, the battery is dead and the charger is at work so I don't even know if it works yet. I'll let you know in the morning, well, later this morning. Of course, since the battery died I've lost all my info, but that should be a simple matter of sync-ing it with my PC here at work and then again at home. Glad you fixed it. I got to have similar fun with my wife's cell phone last week. Zach had tossed it to the floor, and it stopped receiving signals all of a sudden. It's amazing how much stuff is crammed inside those little cases. But I fixed it! Nothing like the feeling of fixing something deemed to be broken for good. Congrats from one geek to another. Here's the connector for the digitizer. You can see the connector tail about the center of the image and the socket it goes into to the right of it. That's all the farther I cold get the frame and that PCB apart. My wife's scrapbooking tweazers came in handy here. 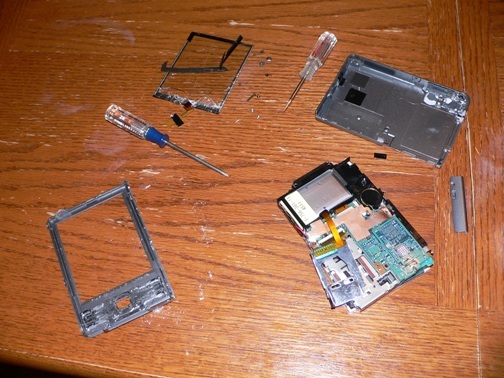 This shows the LCD in it's metal frame, lifted out of the main metal frame. This is the back side of the 'guts'. The memory stick socket is flipped out to the upper left and the battery is slid out to the lower left. The copper foil was screwed down horizontally across the PCB. The battery is all charged again, it took a couple of syncronizations, but all my data is restored too. Hmmm. I also noticed that IESpell isn't catching my spelling errors very well. It should have found 'adn' and 'wil'. It seems to have difficulty with longer strings of text, like most of my blog posts. I did spell check this before posting!